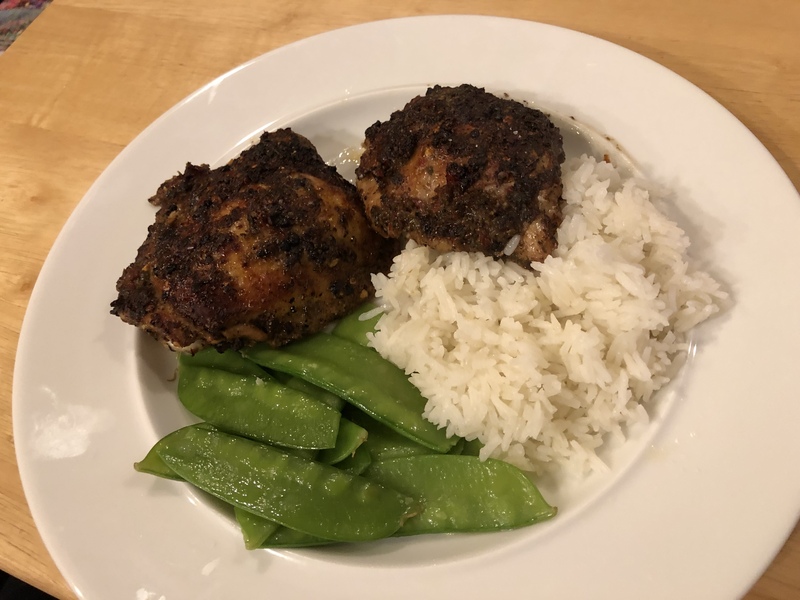 John wants to try making Jamaican-style jerk chicken. I find a no-fuss recipe on the NYTimes cooking site and with much fuss he makes the chicken. The fuss has to do with grinding up a whole bunch of spices, cinnamon, nutmeg, allspice, cloves, red pepper flakes, black pepper, etc., etc. and marinating the chicken over night. Finally he bakes it and then broils it to crisp up the skin. In the meantime I make some rice and snow peas. John eats our dinner with gusto and I do not like it at all. The chicken skin is flabby and, to me, the most prominent taste is black pepper, my most disliked flavor. I give some of my chicken to John and enjoy the rice and snow peas. This entry was posted in Poultry, rice, Vegetables and tagged chicken, Jamaican, jerk, rice, snow peas. Bookmark the permalink.